Sunday, February 10 at 4:00 p.m.
Kyo-Shin-An Arts, an award-winning, contemporary music organization that brings Japanese and Western classical music together, is celebrating its tenth anniversary season. 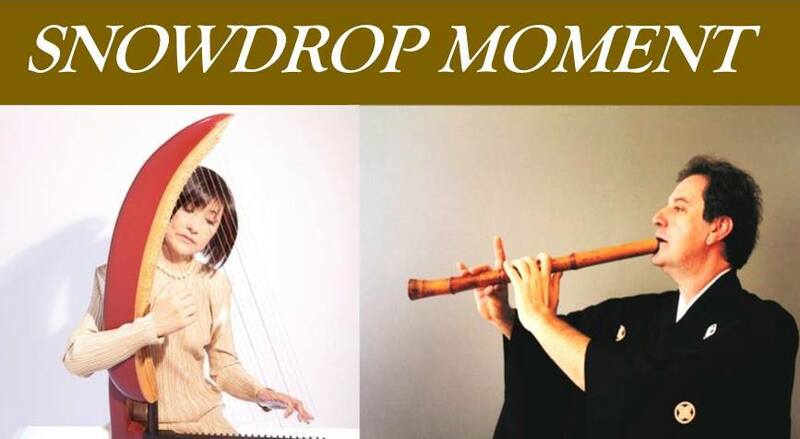 Its upcoming concert, Snowdrop Moment, is a program of solos and duos for kugo, harp, and shakuhachi performed by Tomoko Sugawara and James Nyoraku Schlefer. The beautiful Japanese kugo is an angular harp with an L-shaped body that has its roots in Mesopotamia around 1900 B.C. Once a favorite instrument in local Islamic cultures, it disappeared from East Asia 1,000 years ago and from the Middle East 300 years ago. More than a decade ago, harpist Tomoko Sugawara recreated the instrument from ancient images. Born in Tokyo, Tomoko Sugawara began to play the Irish harp at age twelve and the grand harp at sixteen. A graduate of Tokyo University with a degree in Fine Arts, Sugawara first discovered the kugo in 1994. In 2007, The Asian Cultural Council awarded her a grant to research the instrument in New York. Historical harp maker Bill Campbell reconstructed Sugawara’s instrument based on designs seen in ancient kugo pictures as well as instruments that survived at the Emperor’s treasure house, Shosoin, in Japan. Sugawara has performed on both the concert harp and kugo in many major international venues. Alone or in ensemble, Sugawara and her kugo provide an enchanting, meditative excursion through many cultures, moods, and ages. Her partner and manager, music archeologist Bo Lawergren, augments her performances with amusing anecdotes and painted illustrations of the kugo from various historical contexts. James Nyoraku Schlefer is a Grand Master of the shakuhachi and one of only a handful of non-Japanese artists to have achieved this rank. He received the Dai-Shi-Han (Grand Master) certificate in 2001 and his second Shi-Han certificate in 2008, from the Mujuan Dojo in Kyoto. He has performed at Carnegie Hall, Lincoln Center, the Kennedy Center, Tanglewood and BAM, as well as multiple venues across the country and in Japan, Indonesia, Brazil, and Europe. Schlefer first encountered the shakuhachi in 1979, while working toward a career as a flute player and pursuing an advanced degree in musicology. Today he is considered by his colleagues to be one of most influential Western practitioners of this distinctive art form. He teaches shakuhachi at Columbia University and in his own dojo, which he established in 1996, and a broad spectrum of Western and World music courses at New York City College of Technology (CUNY). As a composer, Schlefer has written multiple chamber and orchestral works combining Japanese and Western instruments as well as numerous pieces solely for traditional Japanese instruments. In December 2015, he was recognized by Musical America Worldwide as one of their “30 Top Professionals and Key Influencers” for his work both as a composer and as Artistic Director of Kyo-Shin-An Arts. From groundbreaking to mainstream, over the last decade Kyo-Shin-An Arts has built and promoted a wide body of new classical repertoire combining Japanese and Western instruments. A 2016 and 2013 CMA/ASCAP Adventurous Programming Award winner (small presenter, mixed repertory), Kyo-Shin-An Arts will be presenting its tenth chamber music season at the Tenri Cultural Institute. KSA works in partnership with established ensembles and Western soloists, bridging two cultures by introducing composers and players alike to the range and virtuosity of Japanese instruments and the musicians who play them. The resulting music provides audiences with a unique introduction to traditional Japanese music within a familiar context and fabulous contemporary music. To date, the organization has commissioned a total of 29 composers for 49 new works. The excellent acoustics and intimate gallery setting of Tenri Cultural Institute create a superb setting for listening to chamber music. Its programming offers audiences the rare opportunity to hear both traditional and contemporary music from two cultures in a setting similar to the music rooms of the courts and castles of both Europe and Japan. More than 300 years of chamber music tradition are presented throughout this series. Performances feature piano trios and string quartets from the great composers of Europe; music from Japan’s Edo period written for shamisen, koto, and shakuhachi; and contemporary music combining Western and Japanese instruments. For more information about Snowdrop Moment and to purchase tickets, please visit the event’s Brown Paper Tickets page.